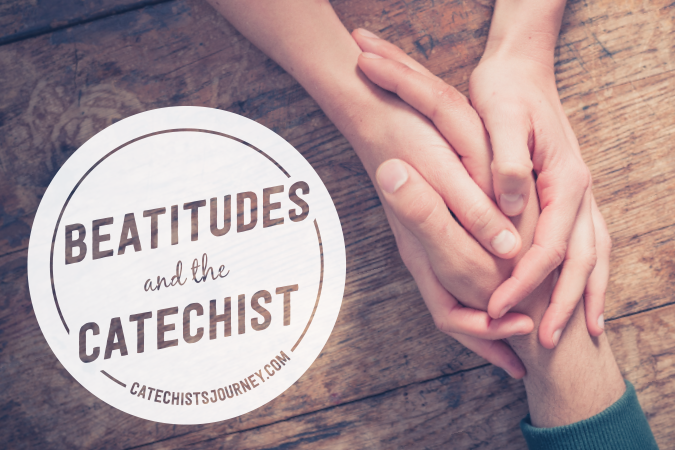 This is the sixth article in a series exploring the Beatitudes as they relate to being a catechist. Happy are the catechists who are authentic, for the young people will see how much they rely on God. Some days, I find it very hard to be motivated to prepare for my faith formation classes. On these days, more than ever, I need purity of heart. I need to approach the young people with authenticity. I cannot just go through the motions of teaching, nor can I fake my enthusiasm—young people can easily tell when our hearts are not into whatever it is we do. I know that prayer will help purify my heart so I can teach my class with the authenticity and passion that young people desire. Fortunately, good curricular materials provide prayers for catechists as they plan their lessons, as well as prayers to begin and end their classes. Here are a few ways to use these prayers—and our own—to help us be authentic disciples. Assess my mood. Before planning a lesson, I take a moment and ask myself, How do I come before the Lord as I prepare this lesson? Am I tired or burnt out? Am I excited and hopeful? I tell the Lord how I feel as I begin to prepare a lesson and ask for whatever grace I need. Keep my ears open. As Julianne Stanz shared in her article “Echoes of Hope,” the word catechist is derived from a Greek word meaning “to echo.” This reminds me that I can pray during class simply by keeping my ears open. One ear listens to the young people, another ear listens to my heart, and my “third ear” listens for the Holy Spirit. Listening is itself a prayer, and the more we practice it, we will recognize the needs of the young people in class, discern how to best respond to them, and follow the guidance of the Holy Spirit. Do a lesson Examen. As I return the classroom furniture to its original arrangement, I have time to reflect on how the class went. Following the instruction of St. Ignatius of Loyola, I do a brief Examen. I begin by thanking God for one or two things that happened during class. Then I review the lesson. (I like to imagine Jesus as lifting the other side of a table with me as I ask him, “What worked? What should I do differently?”) I end by asking for the grace to be a better catechist next time. For me to be a catechist who is pure of heart, I need to be authentic. I need to be honest about how I am doing, and I need to share that with the Lord. I have also discovered that I can be honest with the young people. They can relate to the times when I am not as motivated as I think I should be (or as others assume I am), and they can see how much I rely on the Lord in those moments. That is a lesson in itself. How do you prepare to teach your classes with authenticity and passion? Use Christ Our Life, Grade 4, Unit 5, to help children learn that Jesus gave us the Beatitudes as a guide to happiness both in this life and in the life to come. Bob Burnham, OFS, is a catechist for both high-school youth and the RCIA at Resurrection Catholic Church in Wayne, Illinois. In addition to being involved in youth ministry, he is a spiritual director, speaker, and writer. Bob is the author of Little Lessons from the Saints: 52 Simple and Surprising Ways to See the Saint in You. Bob is also the councilor for youth and young adults in the Mother Cabrini Regional Fraternity of the Secular Franciscan Order. Read his blog about the spirituality of commuting at www.mtransit.org.